Context: The possibility of bleaching vital teeth with peroxide-based products considerably revolutionized esthetic dentistry. Aim: The aim of this clinical study was to evaluate tooth color change and dental sensitivity after exposure to preloaded film containing a 10% hydrogen peroxide whitening system (Opalescence Trθswhite Supreme). Materials and Methods: A total of 13 volunteers, aged 18 to 25 years, participated in this study. The patients used the whitening system once a day for 60 minutes during the 8-day study. For maxillary incisors and canines, the color change was visually evaluated with the Vita color scale before, immediately, and six months after the treatment. Tooth sensitivity was evaluated during the daily gel applications. All whitening applications were done in office and under the supervision of a dental professional. Statistical Analysis Used: The results were analyzed using the Friedman Test (nonparametric repeated measures ANOVA) at a level of 5%, and Dunn's Multiple Comparison Test at the level of 5%. Results: It was verified that the original mean color values observed at the baseline analysis differed significantly from those observed immediately after bleaching, as well as from those seen in the analysis at six months ( P = 0.001). There was no significant difference between the mean color values observed in the immediate time and in the analysis at six months ( P = 0.474). No tooth sensitivity was observed in any patients. Conclusion: It was concluded that the bleaching technique using the 10% hydrogen peroxide system was effective in a short period of time without tooth sensitivity during applications. The possibility of bleaching vital teeth with peroxide-based products has considerably revolutionized esthetic dentistry. Clinical reports ,, have presented excellent results when bleaching techniques are correctly used, particularly under constant professional supervision. Tooth sensitivity caused by dental bleaching may be mainly associated with the exposed dentinal tissue of the teeth that are bleached. , This has been reported in the literature as the major adverse effect found in this type of treatment. Concerned about this undesirable clinical condition, Sundfeld et al. proposed the use of an adhesive system in the areas of exposed dentin, mainly in the cervical and incisal regions of mandibular and maxillary teeth. This adhesive is capable of obliterating the dentinal tubules through the formation of a hybrid layer and resinous tags, which would prevent the transmission of painful stimulation. Even with the variety of whitening materials and techniques available, there is still a lack of clinical trials that provide substantial scientific support for these bleaching products, especially with regard to the application of 10% hydrogen peroxide already provided in disposable trays ready for use. The aim of this study is to evaluate tooth color stability and sensitivity in patients undergoing dental bleaching treatment with a 10% hydrogen peroxide system. The project was submitted to and approved by the Research Ethics Committee of the Araçatuba School of Dentistry, UNESP, São Paulo, Brazil. Thirteen volunteers ranging between 18 and 25 years of age participated in the study. To be included in the study, participants had to meet the following criteria: Tooth shade must be A1 or darker according to the Vita color scale (Wilcos do Brasil Indústria e Comércio Ltda. Petrópolis RJ, Brazil); must practice good oral hygiene; must have no carious lesions, gingival recession, and restorations in maxillary anterior teeth, or fractured posterior restorations; must not be pregnant or breast feeding; must not have had previous tooth bleaching treatments; must be in good systemic condition; must have healthy oral soft tissues; must be a nonsmoker and a nonalcoholic; and must have no history of adverse reaction to peroxides. In addition, participants were instructed to avoid any food or drinks with colorants during the research period. They received information with regard to the technique to be used and the possible risks and benefits obtained. Each participant signed a term of free and informed consent. Prior to dental bleaching, a clinical exam was carried out to observe the presence of exposed dentinal tissue on the incisal surface of the tooth. 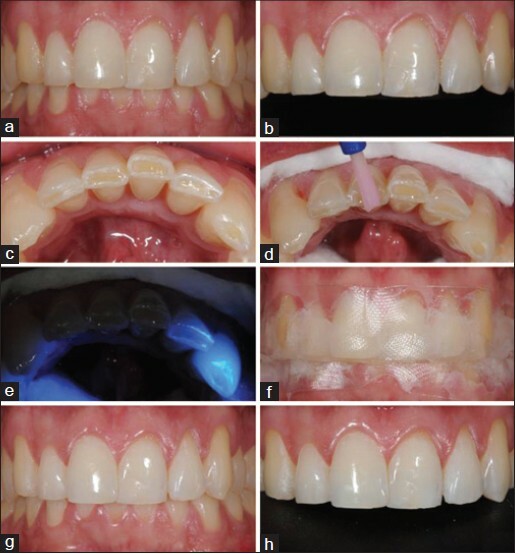 Six patients with exposed incisal dentin received the application of a self-etching adhesive (All Bond SE - Bisco. Inc. 1100 W. Irving Park Rd. Schaumburg, IL, USA) in accordance with the manufacturer's instruction [Figure 1]. The color of the maxillary incisor and canine teeth was evaluated by a duly calibrated examiner using the Vita color scale shade guides (Wilcos do Brasil Indústria e Comércio Ltda. Petrópolis RJ, Brasil) at baseline, immediately after treatment, and at six months after treatment. After prophylaxis with pumice stone and water (where necessary), exposed dentinal tissues were protected with an adhesive system before applying Opalescence Trèswhite Supreme. The molded tray containing the bleaching product was applied to the dental arch to be bleached and adapted to the teeth. The patient was then instructed to apply suction to the tray to fix it against the teeth to be bleached. The molded tray was then removed, and the remaining plastic film containing the bleaching agent was adjusted with light pressure using the fingers to make it fit better against the teeth to be bleached. Each patient used the bleaching product for a period of 60 minutes. After this time, they removed the plastic film that held the bleaching product and washed their mouths with water. While the volunteers were under treatment, they were instructed to avoid sweets and foods that contain any type of coloring agent (coffee, cola, grape juice, or currant juice), as well as acidic fruits (orange, lemon, etc.). A total of eight consecutive applications were performed on each patient over an 8-day period (one application per day) [Figure 1]. All bleaching sessions were done in office and under the supervision of a dental professional. Afterward, patients were treated with seven topical applications of 2% neutral sodium fluoride gel (Aphoticário, Araçatuba, SP, Brazil) for a period of four minutes each. To determine color alteration, the Vita color scale was used (Vita Classic, Vita Zahnfabrik, Bad Säckingen, Germany) with the colors organized from B1 (lighter color) to C4 (darker color) and numbered from 1 (B1) to 16 (C4) [Table 1]. The shades were used to determine the color of the middle third of each tooth being bleached. The tooth color was determined before and after the dental bleaching treatment. A clinical assistant wrote down the colors selected and classified them according to the codes adopted and stated in standardized forms. Color alteration was observed by two duly calibrated operators. When disagreement arose in the assessments performed, the examiners reached a consensus. The results were analyzed using the Kappa test to evaluate the degree of reproducibility between the two examiners. Tooth sensitivity, evaluated according to its presence or absence, was recorded during daily bleaching procedures. The results were analyzed using the Friedman Test (nonparametric repeated measures ANOVA) at the level of 5% and Dunn's Multiple Comparison Test at the level of 5%. It was verified that the original mean color values observed at the baseline analysis differed significantly from those observed immediately after bleaching, as well as from those seen in the analysis after six months (P = 0.001) [Table 2] and [Table 3]. There was no significant difference between the mean color values observed in the immediate time and in the analysis after six months (P = 0.474) [Figure 2] and Graph 1][Additional file 1]. Tooth sensitivity was not observed in any patient during application of the dental bleaching product. In this clinical study, 78 maxillary anterior teeth (incisors and canines) were evaluated with regard to color alteration as a result of using a 10% hydrogen peroxide-based bleaching system, applied during an 8-day period for 60 minutes once a day. A satisfactory whitening of the teeth was observed in a shorter period of time compared with other authors' ,,, using hydrogen peroxide-based bleaching products at a lower concentration. At the baseline exam, the mean shade value presented by all the teeth to be bleached was observed to be 6.05. Clinical analysis performed immediately after treatment showed a mean shade value of 1.62, while clinical analysis performed six months after treatment showed a statistically similar mean shade value of 2.37. These results demonstrate the real effectiveness of the bleaching product used. In addition to this advantage, the bleaching product is relatively low in cost, and can thus be adopted by a large part of the dental community. Furthermore, as the Trèswhite system is a bleaching product that dispenses with the need for fabricating an individualized tray, it can be used in cities and regions where prosthetic services perhaps may not be available. The great differential of the bleaching method used is related to the fact that the product comes impregnated in a cellulose film, dispensing with the use of an individualized tray. The gel's high viscosity functions as an "adhesive" that keeps the cellulose film adhered to both the gel and the patient's teeth, thus diminishing the possibility of the material flowing onto the gingival soft tissues. However, the presence of slight and passing gingival discomfort was reported during the use of this whitening product. This was represented by discrete oppressiveness on some of the gingival papilla, which may have been traumatized mechanically during the act of tooth brushing before the application of the bleaching product. Frequently, this irritation is owing to the oxidative action of peroxide, but no adverse effects on soft tissue were observed by the examiners in the periods of analysis. The tooth sensitivity observed during or in the postoperative period of dental bleaching ,, may result from hydrogen peroxide diffusion through the enamel and dentin. Although it has been related that bleaching with more concentrated hydrogen peroxide causes more pronounced tooth sensitivity than bleaching with carbamide peroxide, , none of the patients showed tooth sensitivity, even when the teeth had exposed dentin tissue on the incisal surface. The authors believe that the application of a self-etching adhesive system in these regions contributed greatly to this observed result by preventing the whitening product from coming in direct contact with the exposed dentin. One can consider the chemical stability of the peroxide contained in the 10% HP gel used in the present study, which may have helped to control tooth sensitivity. Therefore, Chng et al. in 2002 and Palo et al. in 2010, verified the importance of pH in the oxidative power of bleaching gels, so that in addition to the peroxide concentration, the pH may also regulate this oxidative power of the bleaching agent. Thus, although the bleaching agent tested in the present study appeared to be a very strong bleaching agent for home use, its chemical regulation has been adjusted for home use, which allows it to be used with a low rate of sensitivity. Although there are still no data with reference to a more prolonged evaluation with regard to the maintenance of good results for color alteration, the use of strips impregnated with 10% hydrogen peroxide is a good tooth bleaching option when significantly fast results are desired. The performance of dental bleaching with 10% hydrogen peroxide gel with a plastic film for eight days showed significant clinical efficacy after six months, when applied by a clinician in office. 11. Sundfeld RH, Sundfeld Neto D, Machado LS, Oliveira FG, Guedes AP, Anchieta RB, et al. The efficiency of dental bleaching - case reports. Dent Brazil 2009;14:22-8. 12. Aushill TM, Helling E, Schmidale S, Sculean A, Arweiler NB. Efficacity, side effects and patients' acceptance of different bleaching techniques (OTC, in-office, at-home). Oper Dent 2005;30:156-63. 20. Leonard RH Jr, Smith LR, Garland GE, Tiwana KK, Zaidel LA, Pugh G Jr, et al. Evaluation of side effects and patients' perceptions during tooth bleaching. J Esthet Restor Dent 2007;19:355-66. 23. Palo RM, Valera MC, Camargo SE, Camargo CH, Cardoso PE, Mancini MN, et al. Peroxide penetration from pulp chamber to the external root surface after internal bleaching. Am J Dent 2010;23:71-4.